Pasighat: Adi warriors perform their traditional dance during the inaugural function of the 1st Arunachal Spring carnival in Pasighat in East Siang district of Arunachal Pradesh on March 17, 2015. 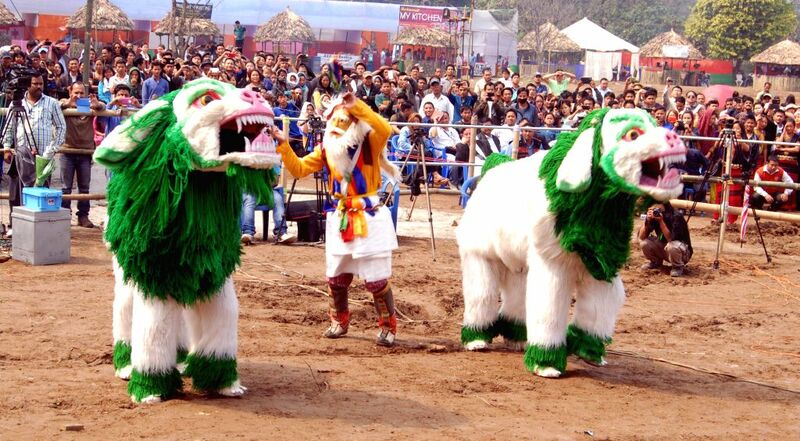 Artists from Tawang perform Lion dance during the inaugural function of the 1st Arunachal Spring carnival in Pasighat in East Siang district of Arunachal Pradesh on March 17, 2015. Arunachal Pradesh Governor Lt. Gen. Nirbhaya Sharma (Retd) addresses the inaugural function of the 1st Arunachal Spring Carnival in Pasighat in East Siang district of Arunachal Pradesh on March 17, 2015.